Viewsonic has announced a rebate scheme designed to make its new touchscreen tablets cheaper. Viewsonic is launching two touchscreen tablets this month - the ViewPad 7, a 7-incher running Android 2.2, and the dual-booting 10-inch ViewPad 100 running both Windows 7 and Android 1.6. At an event in London this morning Viewsonic revealed its plans to refund customers who buy these tablets up to £125 if they trade in an old laptop or netbook after purchase. Providing the laptop or netbook you trade in still works (the PSU and battery must be fit for purpose), you will be able to get £125 back on the 10-inch model and £100 back on the 7-inch. This brings the net prices on the two models down considerably - £385 for the 10-inch, down from £500 and £299 for the 7-inch, down from £399. Viewsonic says it'll also throw in an extra tenner per customer to pay the cost of sending off your old laptop. These rebates will still work to their maximum value even if you manage to buy the tablets for cheaper than their recommended price. There is one caveat though, which is that in order to qualify for the scheme you must purchase from a participating retailer. Stores currently on board are Scan, Misco, Wstore and Xpansys. 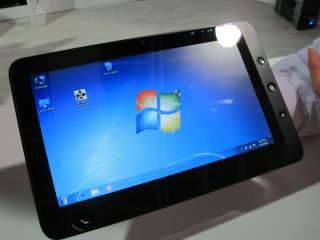 TechRadar will be bringing ViewPad 100 review and Viewpad 7 review very shortly, so stay tuned.